New Hampshire’s lakes – including the beloved Lake Winnipesaukee and Squam Lakes – have provided vacation and sporting fun for families from the state and distant places over generations. Lake resorts offer hospitality and flexibility for everyone from couples on romantic getaways to big, lively families tucked into family friendly lodging and packing the waterfront with reunions of generations. There’s room for everyone and plenty to do – swimming, boating, sailing, fishing – at New Hampshire’s fresh water beaches. Diana’s Baths is a mix of potholes, cascades, slides and small plunges along Lucy’s Brook, tumbling down Big Attitash Mountain. The attractive features of this area are the refreshing pools and potholes for swimming, with easy access to flat rock “beaches” for sunning and picnicking. During high water, the entire area can be engulfed with cascading water. 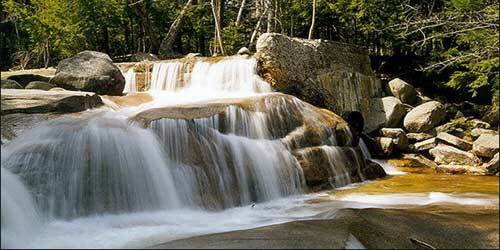 During normal conditions, there is one major waterfall, a 20-foot plunge over granite. The hike to Diana’s Baths is an easy half-mile. There is a large parking lot at the entrance to the path and a pay station. Visitor must buy and display a daily pass on the dashboard. Cost is $3 a day. An undeveloped lake offers swimming and boating. Canoes are Kayaks are offered for rent. See full description of Greenfield State Park. 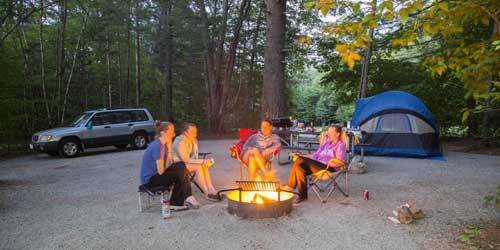 State park of nearly 10,000 acres, offering hiking, biking, swimming and fishing are a few of the favorites. Canoe rentals at Beaver and Catamount Ponds, while rowboat rentals are also available at Beaver Pond. Fly-fishing at Archery Pond. The park is open weekends starting in late May; then daily June through September. Call or check Web site for exact opening and closing dates. A day-use fee is collected at the toll booth near Catamount Pond. 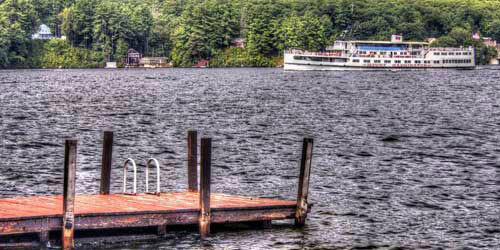 Nice swimming beach on Pawtuckaway Lake, along with plentiful water sports and boat rentals. See full description of Pawtucketaway State Park. Located about five miles east of the town of Weare, Clough State Park is located on the shore of Everett Lake, about five miles east of the town of Weare. Features include a 900-foot sandy beach with two bathhouses, flush toilets and changing areas; picnic tables in a large picnic grove. Admission fee. The park has a 200-foot-long sandy beach for swimming, fishing, and boating. Picnicking and mountain biking also are popular at this park.